We love this easy, nutritious, and fun take on lasagne! See full recipe below. • Chop ends off zucchini and cut zucchini in half. • User very sharp knife to slice zucchini into thin slices. 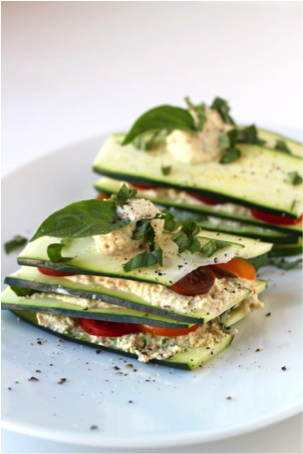 • Lay two slices side-by-side and then top with fillings, layering between more zucchini slices. • Garnish with pepper and serve. This entry was posted in Recipe, The BEET on May 29, 2015 by Judith Smith-Meyer.